Global Inflation Surges, Central Banks Losing Control and Triggered the Wage Price Spiral? 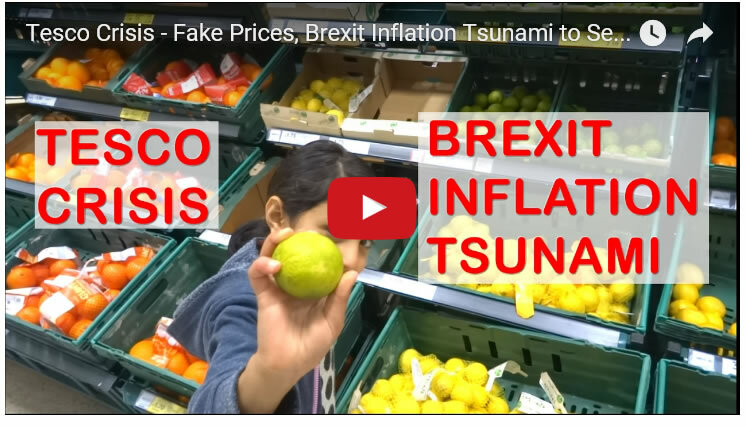 Whilst in Britain, inflation focus is on the surge in prices following the BrExit vote that triggered a 20% drop in sterling which is slowly but steadily feeding its way through the supply chain and heralds a nightmare 2017 for already distressed retailers such as Tesco, Britain's biggest retailer that is literally facing a crisis which I have been covering in a series of videos the latest of which follows a BBC investigation into its 'fake' shelf prices duping customers into buying products at expired offer prices. The implications of sterling's sharp drop are obviously inflationary and resulting in an increase the price of imports and therefore has been exerting upwards pressure on shop prices as suppliers restock at the lower sterling exchange rate. The most recent inflation data for January 2017 has RPI rising to 2.6% from 1.4% before Brexit and CPI at 1.8% against pre-Brexit CPI 0.6%. Whilst factory gate price inflation have risen to 3.5%. However what's worse is that Britain's inflation trend goes beyond the temporary Brexit factor and is becoming subject to an global inflation surge as a consequences of 8 years of central bank zero interest rates and rampant money printing as the US CPI inflation graph illustrates. US CPI jumped sharply higher to 2.5% up from 1.7% the month before. Given the sharp trend trajectory of the US CPI inflation one would wonder if it was the US that had voted for Brexit triggering a 20% drop in the Dollar rather than Brexit sending sterling plunging. Similarly Germany the bastion of price stability is also witnessing the early signs of an surge in inflation, rising to its highest level for 3 years at 1.7%, with the economic basket cases such as Spain not far behind on 1.4%, that collectively have sent euro-zone inflation soaring to 1.8% up from 1.1% the month before, which is a far cry from the deflation expectations of economies that have remained in economic stagnation, even depression for the past 6 years. Meanwhile the euro-zone nation that has suffered the most from being tied to the German Economic Empire, Greece, whilst continuing to have a shrinking economy i.e. likely to experience a further contraction of about 1% for 2017, an economy some 25% smaller than where it was 7 years ago whilst at the same time having been loaded with an additional $400 billion bailout debt burden that ensures Greece remains permanently bankrupt. Nevertheless Greece is also witnessing a surge in inflation to 1.5% up from 0.3% the month before. Which illustrates that regardless of the fundamentals of domestic economies, the euro-zone nations are all tied to Germany, so if Germany experiences sharply rising prices then so will the whole euro-zone. The big question mark is the surge in global inflation temporary or are we about to finally see runaway inflation as a consequence of the world central banks collectively having conjured some $20 trillion out of thin air and printed about $100 trillion in additional debt to save the bankrupt banking crime syndicate. Rampant money printing that asset prices such as housing and stocks have already greatly leveraged themselves to in the mother of all bull markets. Well definitely there is at least some seepage coming out of the banking / asset price system towards feeding the wage (including in work benefits) price spiral, the consequences of which will be for the further loss of purchasing power of savings / bond investments and earnings. Whilst continuing to inflate the price of assets that cannot be easily printed such as housing. Which implies to expect a far higher and sustained spike in UK inflation during 2017 as the temporary Brexit inflation becomes absorbed into a global surge in inflation the real world consequences will be one of a 10% hike in UK food prices during 2017 that will have a severe impact on consumers who are already facing energy price hikes of as much as 14% from the likes of NPower with the City Councils warning of 10%+ council tax hikes to cover the shortfalls in central government funding, all of which is leading towards a perfect storm for the retail sector triggering job losses and store closures. Therefore the key indicator to watch for the inflation mega-trend driver for 2017 is wage inflation that I suspect WILL rise that would sow the seeds for UK interest rate hikes during 2017, for the one thing that central banks fear the most is triggering the wage price spiral. 01 Mar 17, 21:10 Where is my deflation? But, But, what happened to the deflationary collapse? The stock market should have been wiped out by now, gold should be £300 an ounce and I should be able to buy a car for a sack of potatoes a la 1932!!! Did I miss something? There hasn't been any deflation, apart from a month or two.